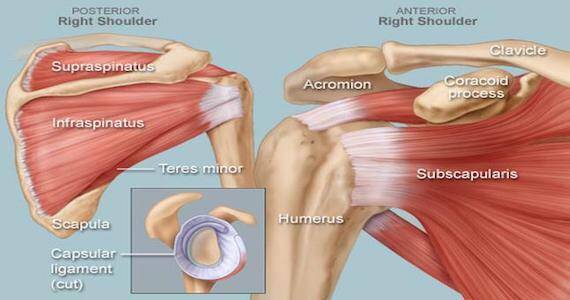 The shoulder joint is a fascinating, intricate joint that relies on the coordination of a huge number of muscles around the scapula (shoulder blade) and humerus (arm bone) to function normally. Unlike most joints of the body, the shoulder relies on active (muscular) structures for stability as opposed to bony congruency. In my experience, many shoulder problems arise from people attempting to do too much, too soon especially in a gym environment. Key aggravating movements are often overhead press and bench press. Poor understanding of technique and appropriate load progressions are key factors that often need addressing to help people get on top of their shoulder pain. Unfortunately, rotator cuff pathology can be quite slow to rehabilitate due to the complexity of the shoulder girdle. Sensible, monitored progression is extremely important to make this process as efficient as possible and prevent flare ups of similar pain in the future. If you have a new or pre-existing shoulder problem and would like to know more feel free to reach out to Andy at andrew@evokerpps.com.au with any questions.